Write@UGA 2019: Mark Your Calendars! PLC Undergraduate Writing Retreat is Back for 2018! 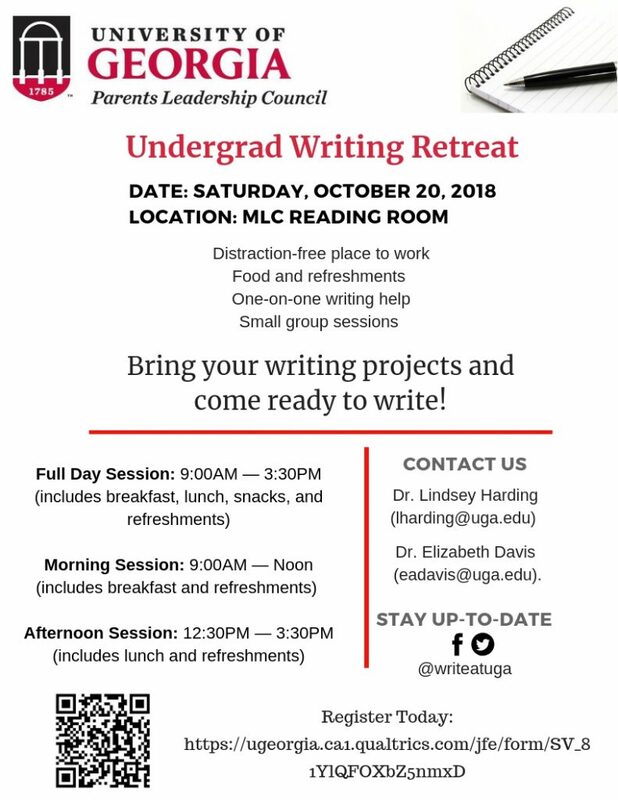 Thanks to a generous grant from the UGA Parents Leadership Council, Write@UGA is thrilled to once again offer an Undergraduate Writing Retreat on October 20, 2018. The retreat is open to all undergraduates and offers an inviting, distraction-free working space in the MLC Reading Room; free food and beverages throughout the day; one-on-one writing help; and break-out sessions with trained writing consultants on a variety of writing and research skills. The retreat is a great way to make progress on a writing project (or two). Half day and full day sessions are available. Space is limited, so make your reservation today! UGA Libraries is hosting the 2018 Capturing Science Contest to encourage STEM communication in a diversity of formats. Undergraduate and graduate students are eligible for $1,700 in prizes. Guidelines: Explain a STEM (Science, Technology, Engineering, and Mathematics) concept to a broader audience using any medium of your choice. Prizes: The top three undergraduate and graduate submission each receive prizes of $500, $250, and $100. 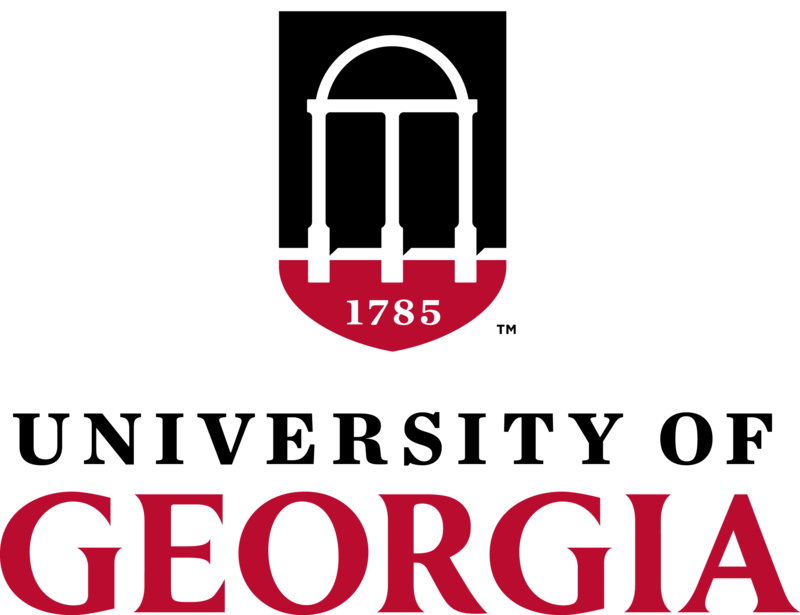 Eligibility: All currently-enrolled UGA undergraduate and graduate students are eligible. Students may submit works used for other class assignments. Multiple entries are acceptable. Formats: Any and all formats and genres are encouraged! Examples include: essays, board games, virtual reality, videos, music, software, apps, curricula, lesson plans, poems, infographics, fiction, and exhibits. See last years’ winners and submissions for more examples. Learn more here. For questions please contact Chandler Christoffel. 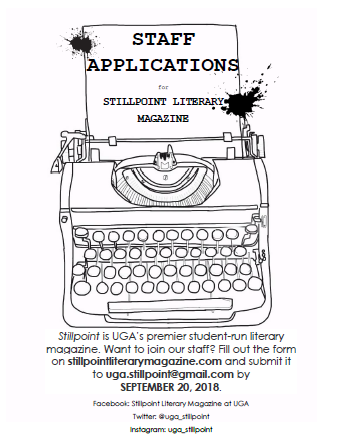 Stillpoint Literary Magazine is UGA’s premier student-run literary magazine that has served as a forum for creative work since 1967. Staff applications are open to all majors and can be found on our website. Applications are due SEPTEMBER 20th. Send completed applications or questions to uga.stillpoint@gmail.com. Informal interviews will be held after applications have been reviewed. For more information, please visit http://stillpointliterarymagazine.com/. 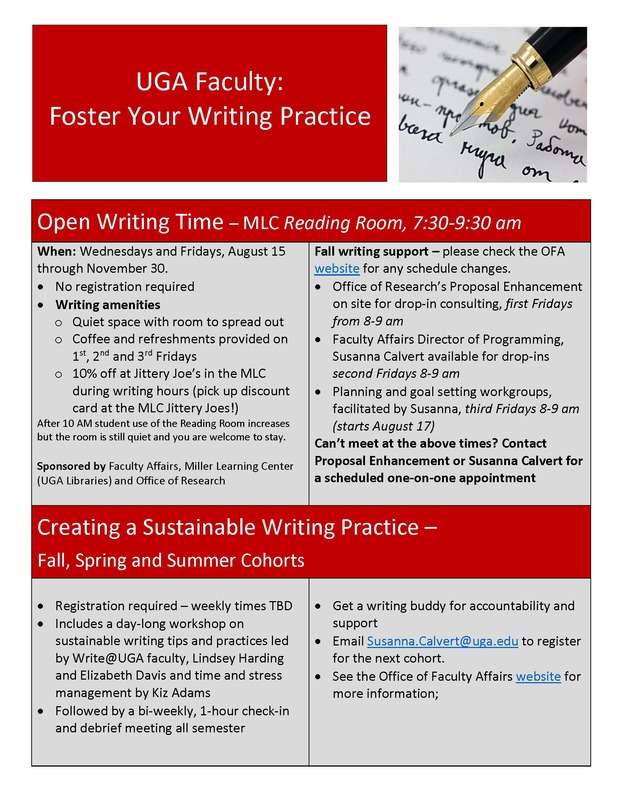 The Office of Faculty Affairs, the Miller Learning Center, and the Office of Research are pleased to offer faculty “Open Writing Time” in the MLC Reading Room on Wednesdays and Fridays during Fall semester 2018 (Aug 15-Nov 30) from 7:30 – 9:30 am. No registration is required and you can get a 10% discount at the MLC Jittery Joe’s during writing hours. Get in some early morning writing this fall and make progress on your writing projects! I have heard this phrase from many teachers who have taught this course and from students who have taken it. This class teaches you how to write in a relevant way, not an abstract, metaphorical analysis way. Dr. Christopher Alexander teaches Technical and Professional Communication, that encourages developing writing skills for the professional world. Many students at UGA can be heard saying something like, “I took this major because I didn’t want to write,” “I am more of a numbers person,” or “I’d rather take a test than write an essay any day.” All of those statements are valid, yet those students do not realize that writing is an integral part of their professional and everyday lives. So, in this course, you will find yourself working on professional writing that is relevant to all majors, including STEM. Alexander is looking to develop skills and knowledge on how to write within various disciplines and fields. He recognizes that writing is not integrated into many classes at the University of Georgia and they rely more on multiple choice exams for evaluations. He feels that students may be “less familiar, less aware or less interested,” in writing, so this class seeks to fill the gap by providing a dynamic approach to writing. Writing is not everyone’s favorite subject/hobby/activity. Ask any college student and they will likely tell you that they dread the constant barrage of essays they are required to churn out. Even the best writers have often admitted that their craft caused more blood, sweat, and tears than health, fame, and fortune. The unamicable relationship between students and their writing is often the result of rubric-based exercises that encourage fact regurgitation instead of critical thinking. Rather than rewarding a student’s comprehension of the subject matter, their ability to restate class material in their writing is evaluated. Dai Hounsell of the University of Edinburgh refers to this as “the undergraduate’s Amazon” because the coursing river of papers is so prevalent in the undergraduate experience. Whenever I think about creative writing, I usually picture someone who is more hip, more stylish, and smarter than me. I think, “creative writing, that’s not for me. That’s for someone else.” Picture: eclectic coffee shop, oversized reading glasses, maybe a handlebar mustache. But what if I told you that you don’t need to drive a hybrid or have your own organic garden to write creatively? What if I told you that the skills learned during creative writing processes help in creating resumes and winning over future employers? I’m an English major whose twin is a Mechanical Engineering major. Besides being opposites – myself a writer and he not so much – he tells me that most engineers struggle in communicating their ideas. He also tells me that often the most terrifying parts of an engineer’s job are proposals. This is the part of the job that requires the most communication skills, which are largely unaddressed in the curriculum he’s taken. It started when I was talking to this girl in my class. She’d just switched to English from a STEM major, and this was her first English class since high school. As we geared up to write our first paper, she was worried about it because she hadn’t written a paper in years. “You could always go to the Writing Center,” I suggested. I tried to explain that it would still be useful anyway, but she shrugged it off, and the conversation moved on.